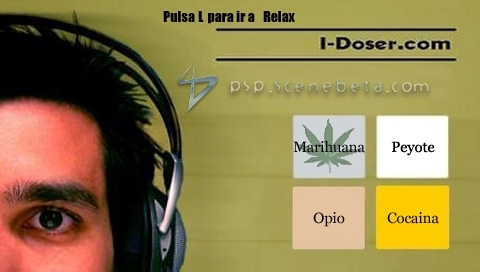 PSP Idoser is a homebrew that offers different sound files that are heard through headphones for about thirty minutes, produces effects similar to those of different drugs. They assert that prompts the brain to feel calm, euphoria, sedation and hallucinations occur as the real drug but lowered doses. The author and the page don't responsible for any damage, the homebrew you use it at your own risk to be aware of the effects it causes. As noted above is an application through sound effects, mimics the effect produced by certain drugs on the nervous system, of course, this homebrew are not at risk. To be effective, we need to hear sounds from 30 to 45 minutes with headphones on, if the homebrew does not work, try different doses of time without going over 45 minutes, as it can be counterproductive. - D-Pad: Navigate through the options. *: This only if you have the homebrew on the Memory Stick. Last edited by Duende68 on Wed Mar 02, 2011 3:30 pm, edited 2 times in total. Are you trying to make us dependent of your homebrew?! Pasarel wrote: Are you trying to make us dependent of your homebrew?! Sorry do not speak very well English.It's okay. Nonetheless, it's quite a funny concept. it doesnt actually get you high. i remember reading an article online about this a while back. iirc certain sounds or combinations of sounds can cause the brain to react similarly to the way it would if you were actually taking certain drugs (supposedly). so while the sounds dont actually get you high, it can (supposedly) mimic the effects of certain drugs. Yeah, these sounds can cause a person to feel some effects. However, I don't think the PSP is a good tool to use for this. The sound reproduction is terrible... I couldn't get anything with this. You need the high quality sound files, and a decent pair of headphones. I think if this app works, it has my Vote! But Make sure the sounds are as HQ as possible. I don't use drugs, personally. I got a second hand high once in my life, and it felt good. It would be nice to get the same feeling, without having to deal with the dreadful drug. To the OP, the submitter of this homebrew: Did you get permission to use those MP3s from that site? If not, we cannot allow you to enter without getting permission. I will be locking this now, but if you can get permission for the MP3s to be used in your PSP version (the idose site mp3s, that is where you got your's for this correct?) then I will definitely unlock it and other than that I don't AS OF YET see anything else that breaks the rules. I wanted to respond to this IMMEDIATELY, normally I'd test the brew first and then lock, but, because this seems a rather obvious "grab" of MP3s from the idose site, please PM me. If you can get permission to use them, and sent that to me via PM on here (or email if you want, pm me and I can get it to you) then I will unlock; in the meantime when I get home from work (about 9 hrs from now) I will test it for other reasons, so that IF you get permission I have tested it for all the other rules like splashscreen etc. So, go and try to get permission. : ) This is a very different type of entry, and drugs aren't something we wish to promote with this competition in any way, BUT, we do not have a rule against "virtual drugs" therefore I will allow entry IF you get permission to use the MP3s. If you already have, just PM me - but I need some sort of proof.